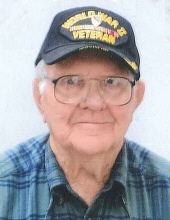 Gerald W. ‘Spence’ Spencer, 92, of Grand Island passed away Saturday, January 12, 2019 at the Good Samaritan Society-Wood River. Funeral Services will be 10:30 AM Wednesday at Livingston-Sondermann Funeral Home Chapel with Pastor Darrell Holzinger officiating. Visitation will be from 4-7 PM Tuesday at Livingston-Sondermann Funeral Home. Burial will be in the Grand Island City Cemetery with Full Military Honors by the Grand Island Veterans Honor Guard. Gerald was born on June 16, 1926 in Wolbach, NE to Ray and Gertrude (Nitzel) Spencer. He attended school in Cushing and Palmer. He entered the U.S. Army on October 24, 1944 serving in the Luzon Campaign during World War II. He achieved the rank of Tech Sergeant and earned numerous medals and decorations. He was Honorably Discharged on September 21, 1946. Prior to joining the Army, he and his father owned and operated Spencer and Son, hauling cattle. He was self-employed as a truck driver for several years and then drove for International Transport. During that time he drove in every state except Hawaii, and also drove in 3 of the 10 Provinces of Canada. He later was the Parts Manager at Doonan’s in Grand Island, which is now Nebraska Peterbilt, where he retired in 1991. Following retirement he worked part-time for Sunrise Trucking and the Dinsdale brothers near Palmer. Spence was a member of the Saddle Club, Grand Island Veterans Club, and the American Legion. He was also a member of the 1st Hall County World War II Hero Flight in September of 2011. He enjoyed tinkering on cars and motorcycles, camping, reading and shooting pool. He loved to visit and spend time with friends and family and especially his dog, Bud. He also never missed the Sunday breakfast at the Grand Island Vets Club. After retirement he liked to travel and spend his winters in Florida. Those left to cherish his memory are his children and their spouses, Larry Spencer of Grand Island, Judy and Lee Dennhardt of Grand Island, Gerald and Andrea Spencer of Grand Island, Rose Spencer and husband Jasung Kim of Lincoln, Dale and Amy Davis of Palmer and Jodi and Troy Hughes of Los Alamos, New Mexico; step-son, Russ and Sue Barr of Colorado; sister, Shirley Bahensky of St. Paul; former spouse, Shirley Mae; and numerous grandchildren, great grandchildren and nieces and nephews. He shared a particularly special bond with his niece, Barb Rhoad and granddaughter, Mallory Rose ‘Smiley’ Spencer. Gerald was preceded by his parents; son, Jon; grandson, Justin; sisters, Barbara Ann and Kie; step-daughter, Cindy; brother-in-law, Richard. Memorials are suggested to the Hall County Hero Flight. Online condolences may be directed to www.livson.com. Livingston-Sondermann Funeral Home is entrusted with arrangements. To send flowers or a remembrance gift to the family of Gerald W. 'Spence' Spencer, please visit our Tribute Store. "Email Address" would like to share the life celebration of Gerald W. 'Spence' Spencer. Click on the "link" to go to share a favorite memory or leave a condolence message for the family.